“Here, we dream in verbs.” Bradley Dice, a University Innovation Fellow from William Jewell College, shares his perspective on an event his team held for the incoming class of students as part of Epicenter’s #uifresh initiative. Sentences written by William Jewell’s Class of 2019 in the “I Will” exercise. On Tuesday, August 25, University Innovation Fellows from William Jewell College hosted an Orientation workshop for the incoming class of students. This workshop is William Jewell’s first major event for #uifresh (University Innovation Freshmen), a nationwide initiative announced in March as a part of the White House Science Fair. The #uifresh initiative calls upon institutions of higher education to expose first-year students to design thinking, entrepreneurship, and innovation in order to attract and retain more students in STEM-related disciplines. University Innovation Fellows candidates Trevor Nicks, Benjamin Shinogle, and Macy Tush introduced students to Design Thinking with methods from Stanford’s renowned d.school. As first-year students enter college, they are embarking on their own Jewell Journey. This “Journey” concept is a holistic view of a William Jewell education: cultivating critical thought, encouraging academic inquiry by engaging big ideas and conducting scholarly research, offering service and leadership as citizens within a local and a global context, and engaging the challenges of our world (philosophical, political, economic, social, scientific, and more) to make and implement meaning for ourselves and others. Across these four adventurous years of college, it’s easy to adopt a “checklist” mentality. Each day of class is one step closer to the real world. Instead, what if we brought the real world into our education? What if we catalyzed a culture of self-starters, fearless and uninhibited innovators who view their education in more than a classroom setting and as more than a degree? How do we equip first-year students with the skills they need to make their dreams into reality? We asked them to share their vision for their Jewell Journey. University Innovation Fellow Bradley Dice worked alongside faculty Ian Coleman, Blane Baker, and Shelly McVay to discuss the importance of mentorship and dreaming big from Day One. 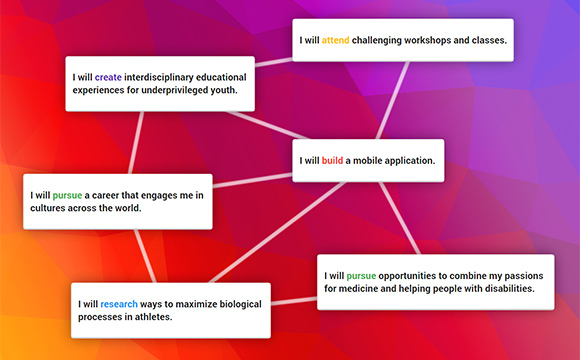 The “I Will” activity helped students put words to their ambitious visions. They crafted statements of their goals that will cascade and resonate through the layers of planning, purpose-finding, discovery, and self-exploration that occur across four years at William Jewell. Students began mapping their dreams to concrete resources like Journey Grants, academic clubs and social groups on campus, connections in Kansas City, and more. Discovering these doors of opportunity can be intensely challenging for a new student, so our rockstar faculty and University Innovation Fellows team provided insight on how to get connected, find mentors, and begin this Journey with the knowledge that their peers and professors are by their side every step of the way. As University Innovation Fellows at William Jewell, we have begun to explore the intersection of liberal arts education with innovation, entrepreneurship, and design thinking. We are developing “maker” mindsets in socially-aware citizens, layering human-centered design on top of world-ready problem solvers, and catalyzing both deep expertise and broad experiences for our students at William Jewell. To learn more about our efforts, just reach out. University Innovation Fellow Bradley Dice is a scientist, software developer, and advocate of open data. Currently a senior at William Jewell College in Kansas City, he is triple-majoring in Physics, Chemistry, and Mathematics, and holds a strong passion for improving scientific methodology and business analytics through technology. Twenty higher education institutions are welcoming their incoming students in a unique way as part of a national STEM initiative called #uifresh. Participating institutions are exposing freshmen to design thinking, entrepreneurship, and innovation in order to attract and retain more students in STEM disciplines. September 2, 2015 — As this academic year begins, 20 higher education institutions are welcoming their incoming students in a unique way as part of a national STEM initiative called #uifresh (University Innovation Freshmen). Through this initiative, participating institutions are exposing incoming freshmen to design thinking, entrepreneurship, and innovation in order to attract and retain more students in STEM disciplines. Ten new schools have joined the 10 schools that committed to #uifresh earlier this year. The initiative was created by the University Innovation Fellows, a national student organization, to combat STEM attrition in the United States. According to a report published by the President’s Council of Advisors on Science and Technology, about 60 percent of students who arrive at college intending to major in STEM subjects switch to other subjects, often in their first year. The initiative was launched on March 23, 2015, during the White House Science Fair as part of a White House collection of initiatives to further enhance STEM in the U.S. The University Innovation Fellows program is run by the National Center for Engineering Pathways to Innovation (Epicenter), which is funded by the National Science Foundation and directed by Stanford University and VentureWell. The program empowers students to become change agents in higher education who help their peers develop an entrepreneurial mindset and creative confidence. The 10 new schools joining the initiative are members of Epicenter’s Pathways to Innovation Program, which helps faculty and administrators fully incorporate innovation and entrepreneurship into undergraduate engineering education. From mid-August to mid-September 2015, students, faculty and institution leaders at the 20 #uifresh schools are collaborating with orientation week organizers to provide learning opportunities for incoming students that are fun, experiential, creative and lead to increased engagement on campus. All institutions secured letters of support from their college and university leaders in order to join the initiative. On August 17, Universidad del Turabo held the activity “Melting Pot Fresh Faculty.” Professors of freshman seminar classes were introduced to entrepreneurship, innovation, creativity and the design thinking methodology. The goal was to help faculty develop confidence in designing experiences and projects to help their students develop skills in these areas. On August 24, North Dakota State University hosted the activity “I3: Ignite Innovative Ideas.” Students relaxed on hammocks and discussed innovative and entrepreneurial activities on campus and in the community. They then took part in a design thinking challenge to create a best and worst feature or change to their dorms, which helped them learn to identify the needs of their “customers” and how their ideas presented solutions. On August 25, William Jewell College hosted the “Creativity & Innovation Orientation Workshop” for the entire incoming Class of 2019. The first activity was a design thinking workshop to help students learn empathy, consider a multitude of possible solutions to a problem, and communicate and translate complex concepts into concise explanations. The second activity allowed participants to discover the breadth of innovation in the liberal arts, envision their college experiences as a blank slate and not a checklist, and think creatively about potential opportunities and their future. On August 26, Michigan Technological University held the activity “Chill Out with #uifresh” with 1,300 incoming first-year students from all majors. The activity, which focused on ways to cope with winter weather, introduced students to the school’s innovation and entrepreneurship ecosystem and opportunities to participate in real world problem solving activities on campus. On August 29, James Madison University held the “Madison Engineering Launch,” the official welcome for all incoming first-year students in engineering. The Launch began with several engineering-oriented games focused on awareness, communication and teamwork, all facilitated by a network of Engineering Leadership program students. The event concluded with a session focusing on reflection, departmental mission and values, understanding the freshmen class, and a design challenge bridging the event to the first day of class. During the Fall 2015 semester, James Madison also offers “ENGR101 Engineering Opportunities,” the first class in the curriculum, which fosters the exploration of engineers, engineering, and engineering work through student engagement on real community needs. On September 3, University of Minnesota will host the event “Dare to Dream!” during College Welcome Day with all 1,100 incoming science and engineering freshmen. Participants will hear stories from upperclass student role models who are chasing their dreams as makers, entrepreneurs and STEM student leaders; learn about campus opportunities such as student groups, innovation and entrepreneurship activities and courses, and student leadership roles; and connect with their new, supportive community of peers, staff and faculty. Additionally, during their first semester, all freshmen will participate in a team-based service learning project in which they will be exposed to design thinking, customer discovery, and development of a minimum viable product. On September 9, Union College will host an event called “STEM-UP,” where freshmen will take part in a series of activities including signing the Union College honor code, learning about current students’ STEM-related projects through poster presentations, exploring hands-on tools such as a MakerBot printer, and viewing an SAE Aero club airplane on display. On September 10, NYU Polytechnic School of Engineering will host “What It Takes to Work at Google,” where students will hear from veteran software engineer Baris Yuskel about his experiences at Microsoft and Google. The school will host “Casual Prototyping” on September 15, where graduate students will explore challenges and creative solutions through hands-on prototyping, as well as “Design for Change” on September 16, a design thinking and ideation workshop for students sponsored by Design for America of NYU. As part of the school’s Fall 2015 “First Year Dialogue,” all incoming students are reading the book Creative Confidence and heard from speaker Hannah Chung, co-founder of Design for America and co-founder and chief creative officer of Sproutel. 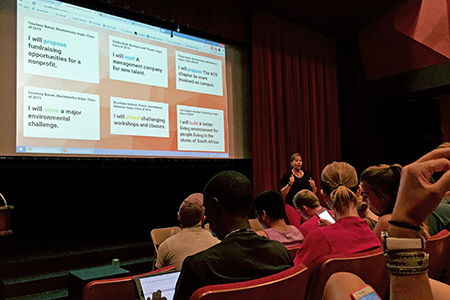 On September 12, University of Virginia has proposed an “Entrepreneurship Leadership Summit,” which will connect community leaders and students in design thinking workshops to create ecosystem-level change. Additionally, Fall semester “Innovation Tours” will expose students to makerspaces and resources connected with entrepreneurship and innovation. The University of Virginia team also held a series of “Innovation Luncheons” and the “Academic Innovation Symposium” in Spring 2015. During the Fall 2015 semester, the Dwight Look College of Engineering at Texas A&M University is launching a major effort to promote the entrepreneurial mindset with the more than 3,000 engineering freshmen. The program includes in-class presentations and discussions about innovation and entrepreneurship as well as videos of successful alumni entrepreneurs. In addition, the program will give freshman teams the chance to collaborate and generate ideas to participate in the U-Ignite video pitch competition in February 2016. Freshmen may also participate in any of the six Aggies Invent events, a series of 48-hour challenges throughout the year, as well as the Innovation and Entrepreneurship Living Learning Community and Pop Up classes. Throughout the Fall 2015 semester, Clemson University will host DEN (Design and Entrepreneurship Network) Weekly Meetings. The DEN brings together students and faculty from any discipline to transform people and their ideas into entrepreneurial thinkers and companies. The goal of the DEN is to fundamentally change the campus culture of innovation and entrepreneurship, starting at the student and faculty level, and looking outward for mentorship and engagement of entrepreneurial community leaders and alumni. During this academic year, Howard University will hold the “Introduction to Engineering” course, which was redesigned with the help from a National Science Foundation grant to integrate innovation as major theme throughout a required first-year course. The new course plan includes interactive presentations and related assignments that develop critical and creative thinking skills in engineering and computer science majors and promote innovation in design. Coursework includes exercises in ideation and prototyping, and students use the design thinking process to complete a major design project. Through partnership with the U.S. Patent and Trademark office, a three-week course module has been developed to expose students to topics related to intellectual property and commercialization. Some students from the Fall 2014 offering of the course have already launched into entrepreneurial endeavors. During this academic year, University of Delaware will hold “EGGG 101,” the first-year experience course for all students in the College of Engineering. The course has been redesigned for this year to focus on the basics of the design process, engage students in project focused on the National Academy of Engineering’s Grand Challenges for Engineering and introduce them to the basics of innovation and entrepreneurship. The University Innovation Fellows and Pathways to Innovation Program are both currently accepting applications. Visit universityinnovationfellows.org/apply to learn more about the University Innovation Fellows program (deadline October 26) and visit epicenter.stanford.edu/pathways-to-innovation to learn more about the Pathways to Innovation Program (deadline September 21).